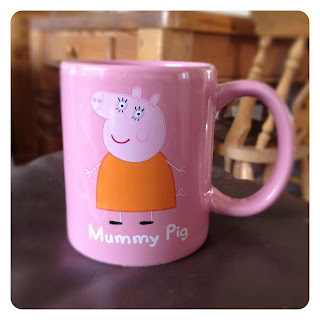 I swear, if I were to go on Mastermind, Peppa Pig would be My Subject. I know everything about that bloody pig and her family and her friends.... and its all down to a certain small person's big obsession with the programme. Our house is FULL to BURSTING of Peppa Pig paraphernalia, books, toys, games. Seriously, its creator must be a multi billionaire. (Note to self: come up with children's character and write some stories etc etc). Yes. Yes we did. 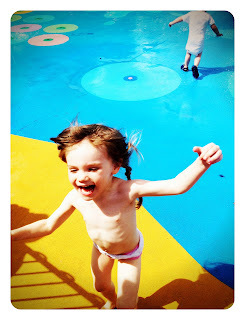 We set off early in the morning, hit no traffic whatsoever, and got to Paultons Park a little before opening at 10am. We flew into a parking space in the car park (excellently directed by parking attendants), sped straight into the theme park (with our pre-paid tickets, defo a good idea) and were off in the direction of its star attraction within seconds of the park officially opening. 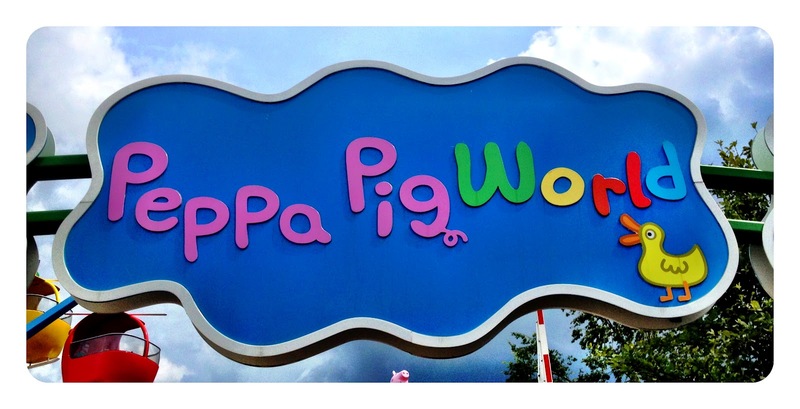 Peppa Pig World is just a small section of Paulton's Park (more about the other stuff later). Its a five minute walk from the entrance and is made up of seven rides (including Miss Rabbit's Helicopter Flight and George's Dinosaur Adventure), indoor and outdoor play areas, lots of things to see, such as Daddy Pig flipping pancakes in Peppa's House, and the obligatory cafes and gift shop. Even I got excited as we walked up to the entrance and I heard the Peppa theme tune playing! Daisy looked as if she was about to burst, just seeing the sign, and the first of many huge figurines that are scattered around. I was a bit disappointed not to be allowed on some of the rides because I'm pregnant (especially as the entrance fee is £21+ for anyone over 1m in height - surely us fat mamas should be classed as a concession and pay a reduced price if we're not allowed to go on anything?). 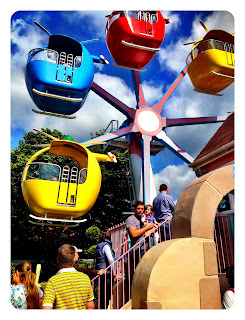 Of course I expected to not be allowed on any of the big rides in Paultons Park, but those in Peppa Pig World are for children from 12 months so I was pretty shocked to be sent away from a 0.5mile an hour helicopter ride after half an hour of queueing. Thankfully Himself was on hand to take Daisy on; I'd have been mighty peeved if I'd not been able to take her on anything. There would most definitely have been lots of tears, probably from a hormonal mother as well as an unhappy child! Paultons Park itself was also fantastic. Himself had a brilliant time on all the thrill rides, including Magma and The Edge. There was also plenty more rides for the little ones, a huge under cover bouncy castle and trampolines, a water park, lots of birds and animals to see (including dinosaurs!!) 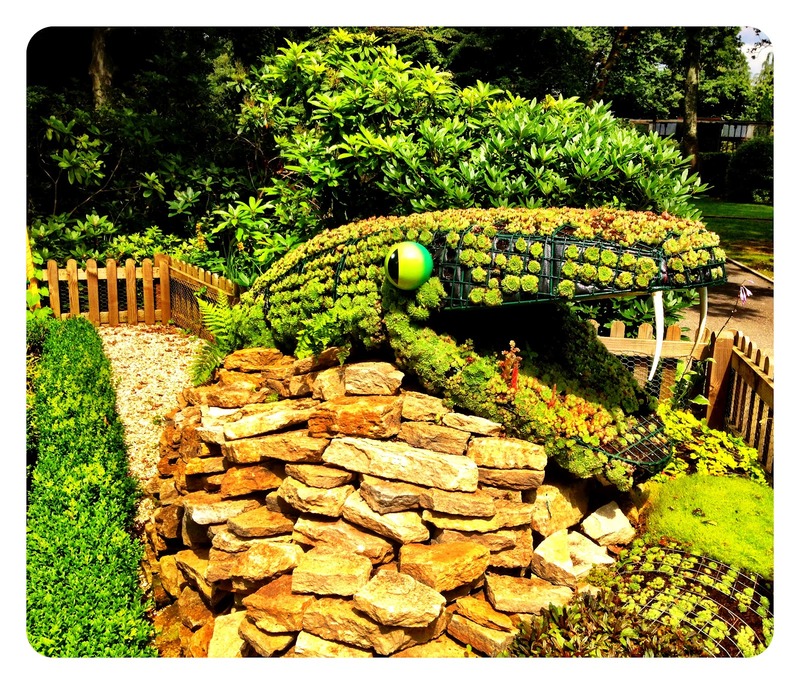 and beautiful gardens to explore. 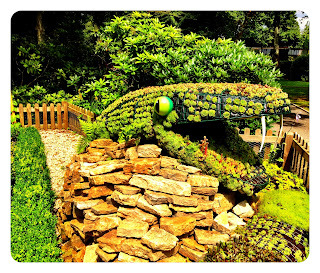 We all had a fab time - it really is a great day out for all the family, from babies to grandparents, and it's only 70 miles out of London down the M3, so perfectly do-able as a day trip for all of you that are from my neck of the woods. For those of you that are slightly further afield, there is a Premier Inn just outside the park which I have very kindly looked into on your behalf, and has lots of deals on entry and overnight stays. 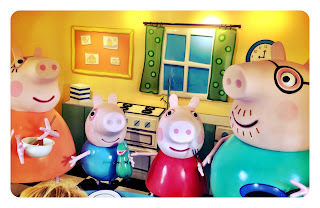 If you have a Peppa Pig obsessed son or daughter, this is definitely a trip you are going to have to make. They will LOVE it. And don't tell anyone, but I actually really enjoyed myself too. My top tips for the day? - Bring a packed lunch. There are loads of gorgeous picnic spots around the park - and a good selection of food outlets, which are admittedly very reasonably priced - but I'm a geek and much prefer to take plenty of food that I know me and my family will like. If you do fancy treating yourself and eating there, have a wander around. 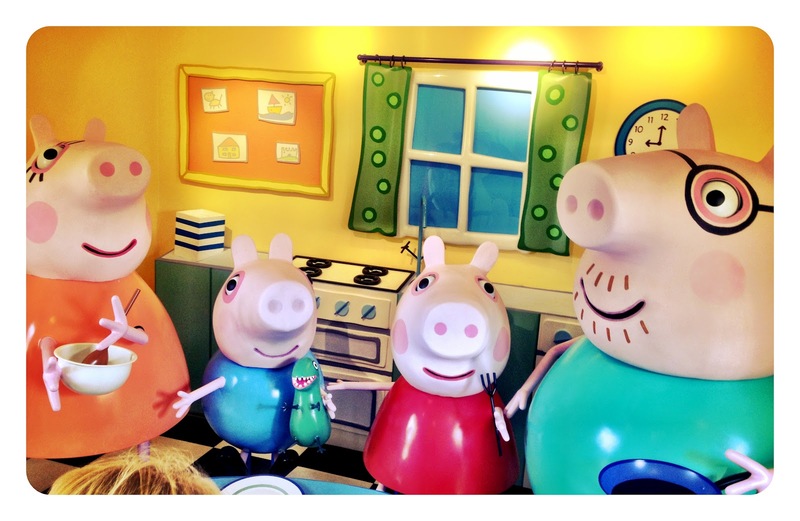 The cafe in Peppa Pig World was ridiculously busy, but other restaurants and kiosks had no queues whatsoever. - Pay the Water Kingdom a visit. It is BRILLIANT. 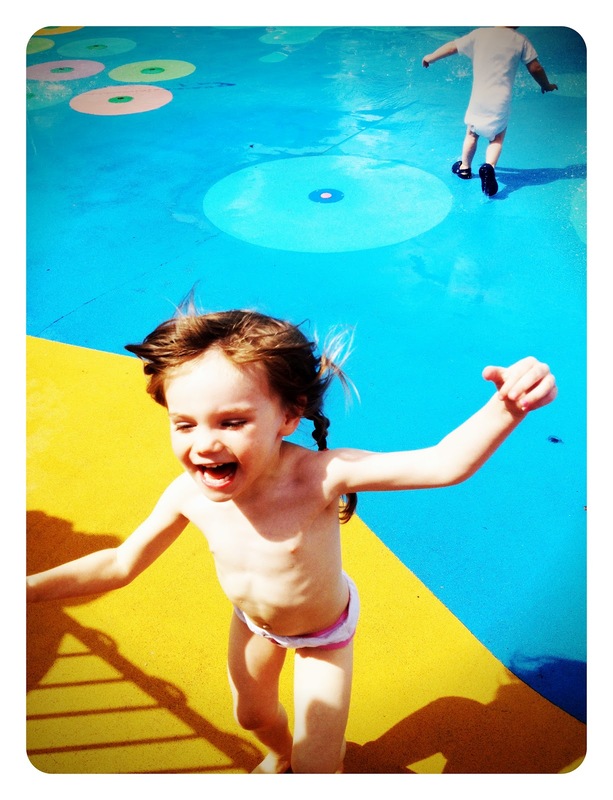 Pack a swimsuit for the kids and let them run riot in the fully enclosed mini water park full of sprinklers and water jets. There are shops on site that sell costumes and towels (at a price!) for emergencies - or you can just pretend you're back in the 80s and let your children run around in their pants like I did! Chuh, who cares?! - Pre-book your tickets; not only will it knock a bit off the price, it means you can skip out the sales kiosks altogether and go straight to the entrance gate. NB This is not a sponsored post. We were not given free tickets in exchange for a review or any other form of payment, monetary or otherwise. It's great that you had a wonderful time. I'm thinking of going this summer with the little ones, so I might consider making a weekend of it and staying at a hotel. Thanks for your tips, it is good to get an advice before I go!